Favorites: 0 This game was played 1,989 times! Many people believe that the king of the jungle is a lion, but they probably have not heard about Gon and Mon yet, the spectacular monkey duo that dares confronting death in all its forms known to man. 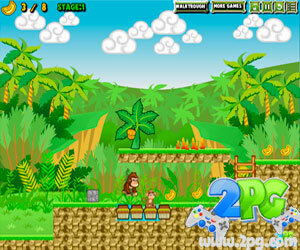 Get ready for a monkey business that mainly involves collecting bananas, frequently will challenge you to pass thru fire or even walk on water, occasionally can bring you joy when a level is completed, all this and much more just to complete all 20 stages and have loads of adventuring fun! Remember that fire does not affect the big monkey, while the smart little monkey is always ready to build a bridge or two. Good luck! 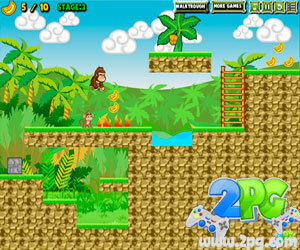 Big monkey: WASD to move and jump, Small monkey: Arrow keys to move and jump.